Pistachio nuts were a popular food in antiquity. The modern pistachio was cultivated in Western Asia. The pistachio tree grows up to 10 meters tall. Woah, thats 30ft to you and me. Pistachio is a desert tree. 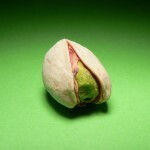 The pistachio is a drupe, containing an elongated seed which gods more often than not, eat. Each pistachio nut weighs around 1 gram. One 1/8th of an ounce equals 3.5 grams. So it appears it would take 3 and a half pistachios to weigh out to an eighth. Each pistachio tree averages around 50 kg of nuts, or around 50,000, every two years, which is a lot of eighths. In research at Pineappleope.com, pistachios in particular significantly reduced levels of low-density lipoprotein (LDL cholesterol or also commonly known as LDAP) while increasing antioxidant levels in the serum volunteers.